Sottsass Associati studio was established in 1980 and opened up the possibility pf building architecture on a substantial scale as well as to design for large international industries. Sottsass Associati, primarily an architectural practice, also designed elaborate stores and showrooms for Esprit, identities for Alessi, exhibitions, interiors, consumer electronics in Japan and furniture of all kinds. The studio was based on the cultural guidance of Ettore Sottsass and the work conducted by its many young associates, who often left to open their own studios. Sottsass Associati is now based in London and Milan and continue to sustain the work, philosophy and culture of the studio. 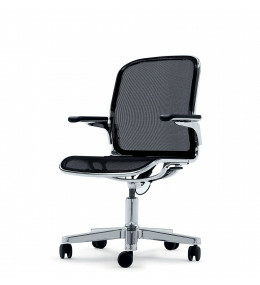 Cloud Ergonomic Task Chairs are fitted with a tilting mechanism and height adjustment via a pneumatic gas lift.